Between Jan and April, in conjunction with annual winter exhibition. Mon, Thur-Sat, 10am-4.30pm; Wed, 10am-9pm; Sun, 11am-4.30pm; Tue, closed. With its castle like façade and a striking interior, Two Temple Place is one of London's most prestigious settings for corporate and private events. As well as being available to hire, Two Temple Place also hosts an annual exhibition between January and April, showcasing objects from museums outside of London to raise awareness of collections being shown throughout the UK. Built by William Waldorf Astor in the 1890s, the house boasts a beautiful interior of wood and marble, as well as extravagant carvings and richly decorated screens. What are the best dining options near Two Temple Place London? 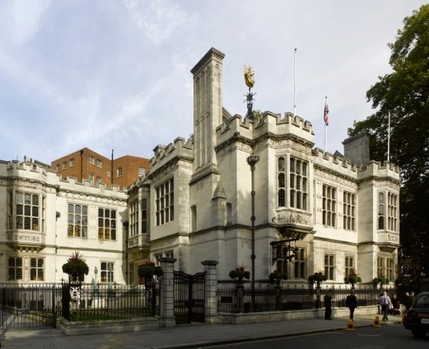 Two Temple Place gyms, sporting activities, health & beauty and fitness. The best pubs near London Two Temple Place. Two Temple Place clubs, bars, cabaret nights, casinos and interesting nightlife. Where to have your meeting, conference, exhibition, private dining or training course near Two Temple Place. From cheap budget hotels to luxury 5 star hotels see our discounts for Two Temple Place hotels, including Apex Temple Court Hotel from 89% off.